Solitary confinement for chickens : when and how to do it. 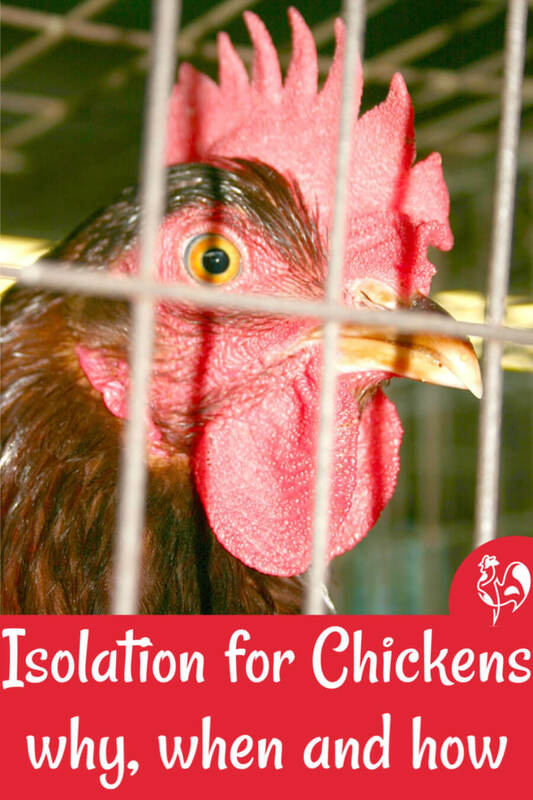 Solitary confinement for chickens - when and how to do it. There are times when chickens need to be separated from the flock for their own good, and other times when sentencing to solitary confinement may do harm. Here's how to judge which is which, and a suggestion as to how to set up a suitable place. This is quite a long page, so these are links to the different sections if you want to get information quickly. A quick list of what you'll need. When confinement should be completely solitary. When confinement can mean containing but not separating. Setting up a suitable place to keep a chicken confined. What does not work as a suitable container? What makes a good container? What's the best thing to use for solitary isolation? Where to buy products to make a good isolation container. Here's a quick summary of the basics you may need at a moment's notice. A large, wire dog crate. Failing that, a tote box or other large container such as a garden tools container box. A way of covering it to prevent prevent escape. I use chicken wire, hardware cloth or the grill from a large outdoor barbecue. Covering for the bottom to prevent slipping if you need to house very young chicks. 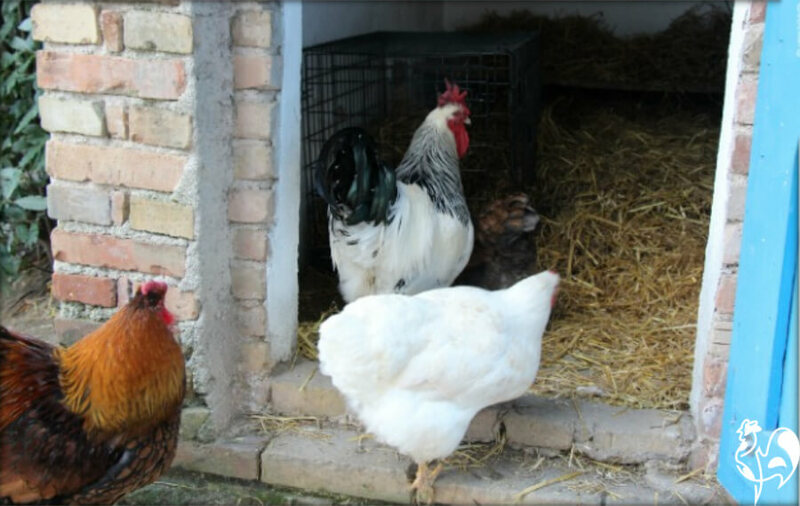 Bedding such as wood shavings or straw for older poultry. Containers for food and water which are small enough to be useable but stable enough not to spill. Your poultry First Aid kit. General suggestions about solitary confinement for chickens. Don't wait to plan this until you need to separate one of your girls (or boys) from the rest of the flock. Think about it before it happens - otherwise when the time comes, you'll panic - and you may cost the chicken its life. Planning should take account of two different scenarios : what you would do if you needed to separate out a hen (or two) from the rest of the flock and keep them completely apart; and what you would do if you needed to confine one bird but allow it to be within sight and sound of its buddies. Wherever you place your isolation crate needs to be draught-free but does not necessarily have to be hot. The isolated bird will need to have easy access to both food and water, particularly if it's in isolation because it's ill.
Solitary confinement : when complete isolation is a must-do. It's not automatically a good idea to separate a bird from the rest of the flock. Re-integrating them again can be a problem - and chickens are sociable creatures. They don't like being by themselves. But there are times when it's not just a good idea to keep one apart from other flock members - it's a must-do. Here are some reasons. 1. 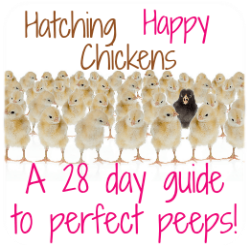 Any new flock members : If you introduce new birds from outside your own flock you need to keep them quarantined for at least two weeks. That is enough time to allow any diseases or illnesses to become apparent. Mixing them in with your existing hens straight away runs the risk of introducing disease - even if you think you can trust whoever you bought them from. 2. 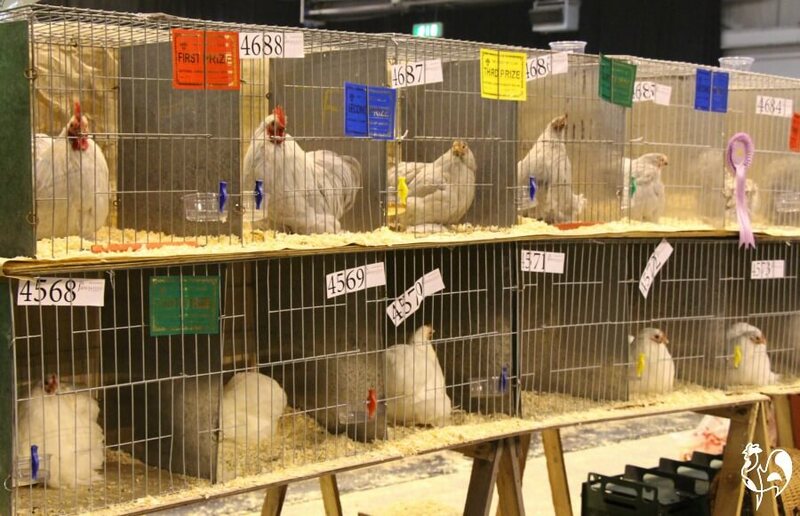 Chickens bought from a show : It's particularly important to observe quarantine if you buy from a show. Don't assume show birds will be disease free - so many in close proximity to each other can be a breeding ground for bacteria which may not become obvious for several days. Show chickens may pick up a problem from their neighbour. Isolate them for three weeks if you buy at a show. 3. Wheezing chickens : If you have any of your own hens who are displaying any signs of bronchial problems, you will need to keep them separate and apart. Coughing, sneezing and wheezing are all tell-tale signs. 4. Birds who look unwell : It's not always easy to tell what's wrong with a chicken. Sometimes they just appear listless and 'hunched up' without there being an obvious reason. In those circumstances I would also choose to isolate until I'm sure it's not going to be a problem for the rest of my flock. 5. 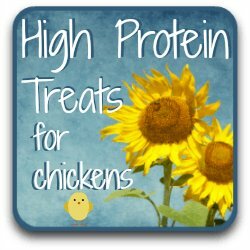 Other things I would isolate for are when a chicken is 'hunched over' and / or fluffed up; if their poop has any signs of blood; if their comb and / or wattles are looking particularly pale; if they aren't eating or, importantly, drinking; if their breathing is laboured; if they're 'panting' - breathing heavily through an open beak. When confinement doesn't have to be solitary. If you've ever had to introduce newcomers to your flock you'll know that it's not an easy task. It affects the pecking order and it can create sometimes quite unpleasant battles. The same applies to re-introducing a bird who has been away from the flock for longer than a day or so. So removing a chicken completely from the rest of the flock is best avoided if it can be. These are circumstances where it may be necessary to separate, but not isolate, your flock members. 1. A bully : Any chicken who is deliberately bullying others may need to be removed from the flock for a while but it's very important s/he's kept within sight and sound of them. 2. Non-contagious illness : A bird who is unwell for any reason other than a potentially transmitting illness, for example an injury to its leg or wing, or a prolapsed vent. The individual will need time away from the flock to avoid being bullied, pecked or trampled, but does not need to be taken away from them altogether. He or she just needs a place of safety for a while. 3. 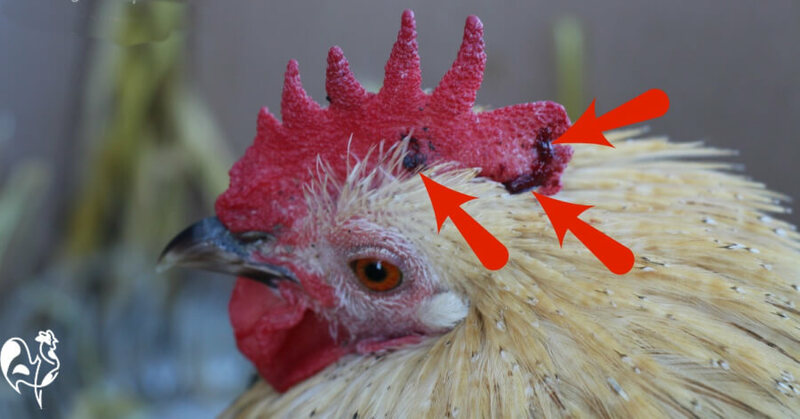 Any signs of injury or bleeding : Chickens are ruthless and the fact that they're attracted to red items means that, no matter how long they've lived together, any sign of blood will lead to pecking and can ultimately cause death. This would apply to a bird who, for example, has had an injury caused by a sharp object. Here's an example : this little bantam Sablepoot roo had injured his leg and wasn't able to move. Before I found him, the flock had recognised weakness and pecked at his comb. He needed isolating to allow his leg to heal and to prevent further injury as his friends would be attracted to peck the bloodied parts. Setting up a suitable place for solitary confinement. If the chicken needs to be removed from the flock completely, you should find a space which is quiet, draught-free and shaded. It should be away from family members who may knock into it and in particular from pets - a sick bird doesn't need any additional stress. If s/he needs to stay within sight of the rest of the flock, place the container in the coop itself, if there's room. Again it should be away from draughts and you need to be sure that other flock members can't get into it. My dog crate sick bay, placed in the coop. The straw gives extra insulation for a sick or injured chicken. What's not suitable as a container? I've used cardboard boxes occasionally to put a hen in if she doesn't need to be confined for very long, or when a chicken needs to go our into the fresh air for a bit rather than stay in a coop all day. Just add some bedding, bowls of food and water and hey presto - a portable sick bay. But although it's quick and convenient - most people have cardboard boxes lying around - chickens do tend to poop a lot, and that can make a cardboard box very wet and very smelly very quickly which can cause disease. It's a good short-term emergency solution and good for chicken day-care, but not a long term solution. Nest boxes are generally too well used to make good isolation units. 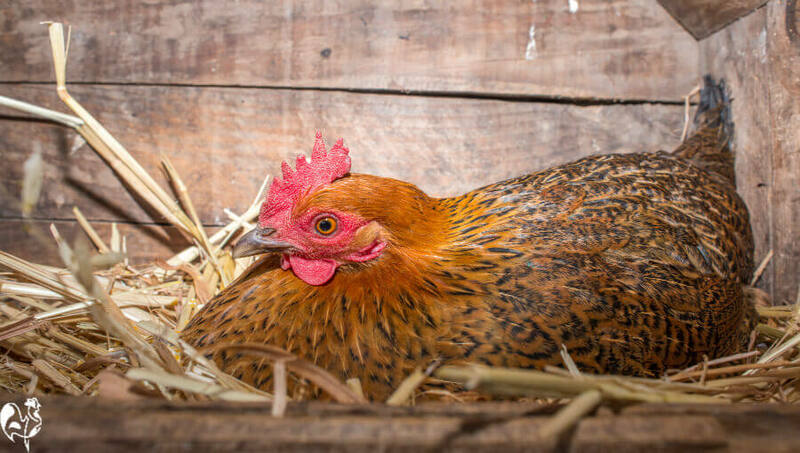 Nesting boxes : This will only work as an emergency solution if you have nothing else available, and is only for keeping chickens isolated but within sight and sound of the flock. Hens often line up to use the same nesting box to lay in, even when there are several others available. If you have one that's never used and is relatively large, it's not difficult to attach some chicken wire over the front, line it with some form of bedding and add small food and water bowls. The disadvantage of this method is that nest boxes are often small - your isolated hen really needs space to stand up, stretch her wings and turn around. 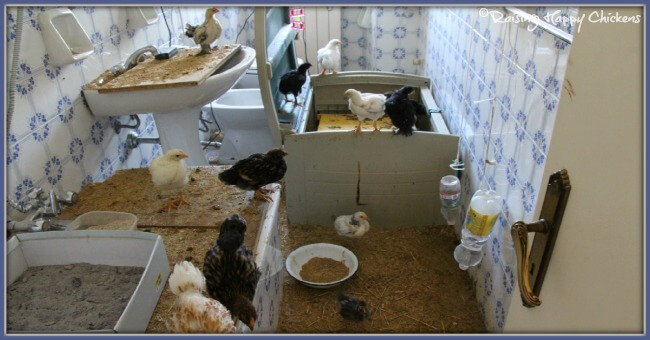 Adding water bowls in a confined space can lead to wet bedding when it gets knocked over - and confining a warm hen to such a small space for any length of time can also lead to a breeding ground for mites. What may be suitable for solitary confinement? 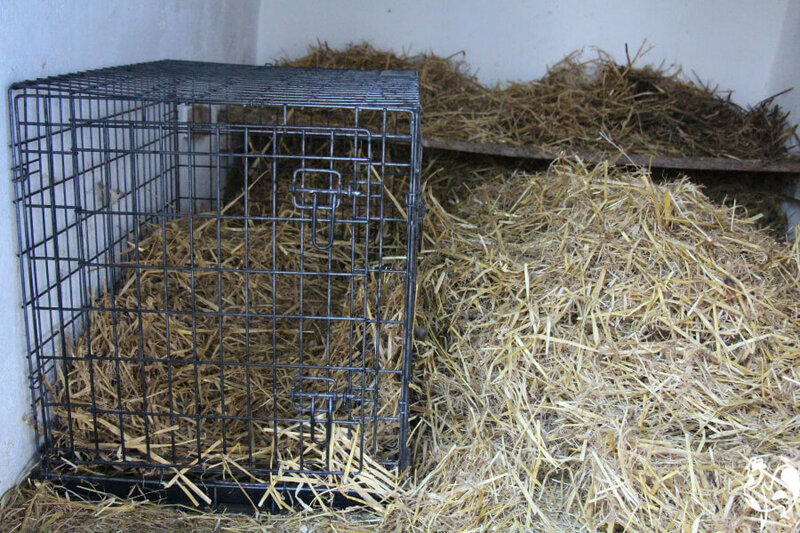 However, it's a good choice if you have one or two hens who need confining right away from the flock, particularly if nights are genuinely freezing. If you do choose this, remember that chickens do not need powerful indoor heating - they have feathers. Unless your hen is very ill and in need of great warmth, switch radiators right down or turn them off altogether . Also be aware that it will take you a very long time to restore your bathroom after they've finished with it, no matter how careful you are. My smaller tote box brooder, with non-slip flooring and hanging water bottles. Large garden tools container or tote box : I use these as a brooder for new chicks (different sizes as they grow) but they're also excellent for containing a hen who needs to be away from her friends altogether. The solid sides ensure that cold draughts don't penetrate and the tops are easily covered - I use the grill trays from an outside barbecue. Again, the bottom needs covering to prevent slipping, particularly with young or sick chickens. Hang bottled water from the top using chicken wire or the grill plus a soda bottle and brooder bottle caps, available from The Chicken Fountain at Amazon. (In the photo above you can see them hanging from the towel rails, in this pic they're suspended from a grill). 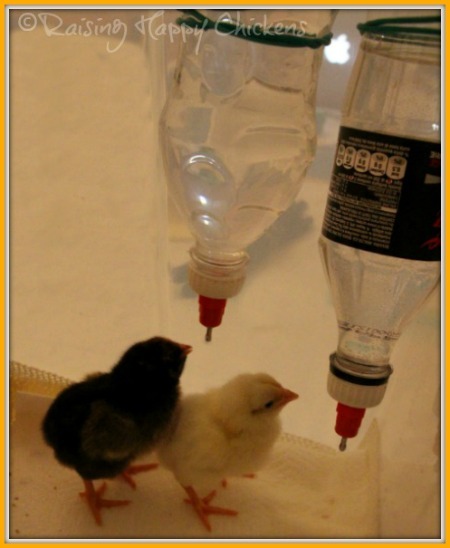 They keep the container dry and make sure the chicken doesn't overturn a bowl or plastic container - and even just hatched chicks learn how to use them very quickly. What works best as an isolation container? Dog crate : This is very much my preferred option for a way of keeping chickens in solitary confinement, whether they're able to be near the rest of the flock or have to be alone. It's small enough, accessible, portable and provides an easy way of hanging a drinking water bottle. Because a crate is small enough to be left in a reasonable sized coop it also allows visits from flock members without any danger to an injured bird, and prevents them having to be re-introduced to the flock later - which can in itself be traumatic as the pecking order is re-affirmed. My isolation cage placed within the coop. Keeping an injured bird separate yet within the flock allows for sick visits! It's also possible to place a smaller, plastic dog or cat carrier within the larger crate as a sleeping compartment whilst having the crate as a (very small!) yard, which gives the chicken the opportunity to stretch their legs and keeps food in a separate place so it doesn't spill as easily. Where's the best place to get an isolation crate from? A lot of people use these wire crates for puppy-training and want to get rid of them once the puppy has grown into an adult. So e-Bay and Craigslist are a good place to start. Pet shops usually stock these too, but they tend to be quite expensive when compared to online prices. The crate I use is sold by Amazon (below). I chose it because it's large and because it has a divider so that if I need to keep two hens isolated they can share the same crate, but still have their own place. This helps when, for example, they're isolated because of injury or a prolapsed vent and will be pecked if they're left together. If you found this page about when to use solitary confinement useful, you may also like these. Just click on any of the pics to go to that section - and enjoy!